We are happy to see Karla Brodie being featured in the Sunday Star Times (18 June 2017). In an article by writer Stephen Heard, he writes about his first experiences of Restorative Yoga and about Karla’s classes. Wonderful to see the news about Restorative Yoga spreading out into the media, bringing it to greater awareness. Below is an extract from the article with a link to the full text and more photos on stuff.co.nz. Good news for the inactive — restorative yoga allows you to get healthier by practically doing nothing at all. I signed up with Auckland’s Contemporary Yoga Centre to attempt the sleepiest of all the yogas. Restorative yoga isn’t your typical method of sun saluting. It’s part yoga, part meditation, and at times, part snoozing. Inspired by the work of B.K.S. 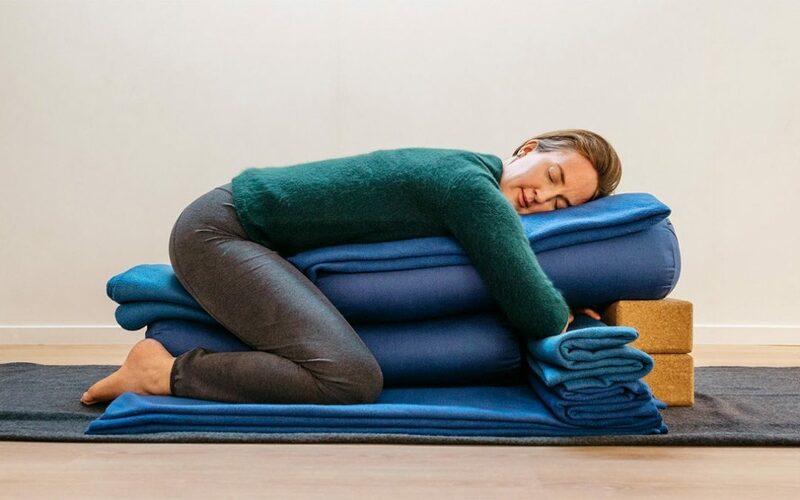 Iyengar — the yoga maestro who trailblazed drawn-out poses and the use of props to support the body — the practice uses blankets and large sausage-shaped yoga pillows (or bolsters) to assist with poses that are held for extremely long periods of time.